Analysis: Doyle missed Weeks 3 though 7 of the 2018 campaign with a hip injury and later landed on injured reserve when he suffered a kidney laceration in late November. The second issue may have pushed back his timeline for getting the hip addressed, but he's still hoping to get back on the practice field by late July or August. 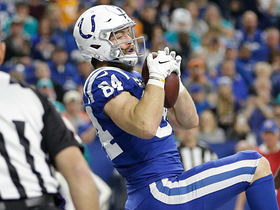 Once he's back up to speed, Doyle may find himself in a timeshare with Eric Ebron, who erupted for 750 receiving yards and 14 total touchdowns in 2018. Analysis: Doyle played a season-low 38 offensive snaps (55 percent) against Miami, hauling in each of his four targets for 16 yards and a touchdown. It's unclear if Doyle's injury is related to the hip issue that caused him to miss five consecutive games in the first half of the season. Whatever the case, Eric Ebron should now have volume consistency to go with the enormous touchdown upside he has already displayed. 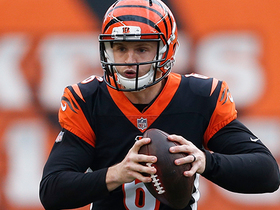 Coach Frank Reich is expected to provide more insight into Doyle's situation later Monday. 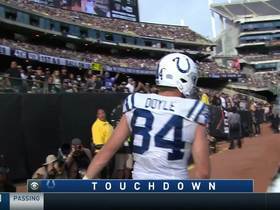 Doyle caught all four of his targets for 16 yards and a touchdown during Sunday's 27-24 win over the Dolphins. 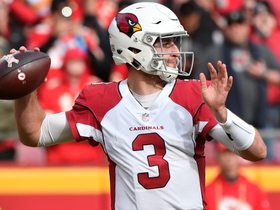 Analysis: Doyle's long gain went for just seven yards, but he salvaged his day from a fantasy perspective with a 1-yard touchdown reception in the second quarter. Meanwhile, Eric Ebron enjoyed more targets and receiving yardage, adding a pair of touchdown grabs of his own. While still involved in the passing attack, Doyle has taken a back seat to Ebron and and T.Y. Hilton, who continue to thrive alongside Andrew Luck. He'll hope to make a bigger impact next Sunday against the Jaguars. 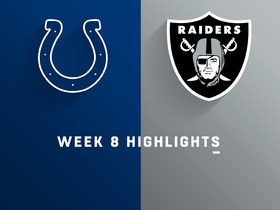 Doyle caught all four of his targets for 43 yards during Sunday's 38-10 win over Tennessee. Doyle had three receptions for 36 yards on three targets in Sunday's win over Jacksonville. 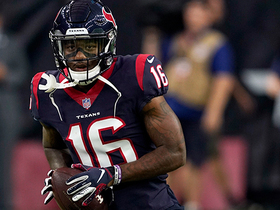 Analysis: After Doyle had six receptions and seven targets last week in his first game back after missing five games due to a hip injury, it looked like he would dominate the targets at tight end. His performance was underwhelming and paled in comparison to Eric Ebron's three-touchdown performance. However, it's worth noting that Ebron played just 21 snaps on offense while Doyle played 48 snaps. Ebron had a similar number of targets. 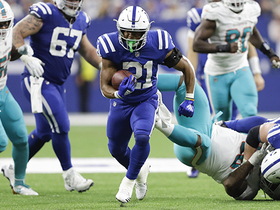 Indianapolis Colts running back Nyheim Hines rushes for a 16-yard gain. 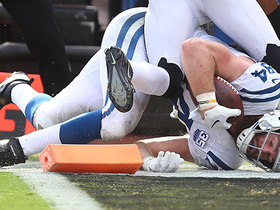 Indianapolis Colts quarterback Andrew Luck darts a pass to tight end Jack Doyle for a 1-yard touchdown. 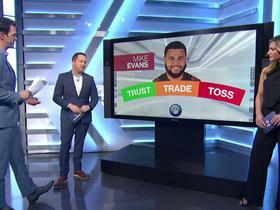 NFL Network's analyst discuss which inconsistent players you should trust, trade or toss for Week 11. 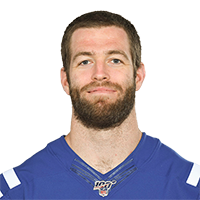 Indianapolis Colts tight end Jack Doyle trucks defender for his first touchdown of 2018.